The player controls a sun, of a sort, guiding the growth of a dark viny plant. The plant tends to grow toward the black, geometric sun, sprouting leaves, as the viewpoint moves ever-higher through a hazy, dusty world. Tiny golden creatures flit about, one at a time, above the vine. Until the vine entangles them, and draws them downward, to further fuel its growth. Your goal is to catch, ensnare, or otherwise trap the little golden flying things. Not that you have to. I prefer to let the things go, personally. Indeed, the golden creatures struggle to escape, seeking any tiny crack in the vine’s tangle, even burning their way upward through the mass as the game progresses. It’s futile, though; with enough persistence, the vine surrounds them, and they fade away, causing the vine to split and grow more wildly, and the dark sun to grow larger and more complex over the course of each “wave” of creatures. The game is open to interpretation, but it made me feel uncomfortable, similarly to how Shadow of the Colossus made me guilty for killing the majestic Colossi. 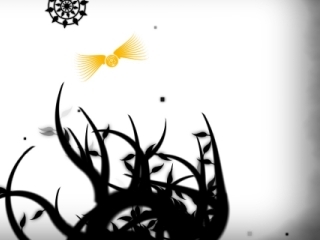 The dark vine is under the player’s control, but only barely; the player has no control over when one tendril stops growing and another one sprouts. To me, it felt like I was barely directing a malevolent thing, an overgrown carnivorous plant that left behind a trail of dense, tangled darkness. As the sad guitar music played, I empathized more with the struggling, desperate golden things than the hungry vine. There’s no true conclusion to this game. Once the vine has grown to a certain level of convolution, and the golden creatures can burn their way through almost fast enough to survive, the game just continues, providing a new, identical creature when the previous one dies, as the plant grows upward through the murky sky. This is a game about growth. Growth at the expense of all else. It’s sad and beautiful. Games like Tetris and “Phyta,” games with little narrative but strong gameplay and imagery, are important, I think. Like poems, they can communicate more directly with the emotions and are more purely interactive. They are more about play than about story, more heart than mind. They can be about organizing and clearing away, or they can be about growing and consuming. It’s important with all the discussion of narrative and player agency and character development to remember that video games and interactive entertainment are on a fundamental level about interaction and how that interaction affects us.